From left, director of Penwith College Martin Tucker, head of Cape Cornwall School Sarah Crawley, executive headteacher Jan Woodhouse, Rachel Thomas from the Interim Executive Board, CEO of TPAT Jenny Blunden and St Ives MP Derek Thomas. 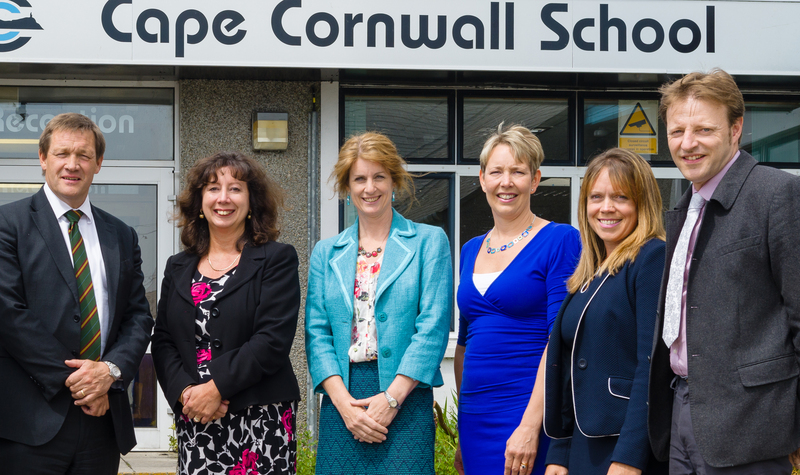 Cape Cornwall School is to join Truro and Penwith Academy Trust, it has been announced. The school became subject to special measures following an Ofsted inspection that took place in March 2017. Staff have been working closely with St Ives School and Ofsted have recognised the value and impact of this support in their routine monitoring visits over the last six months. In their most recent visit earlier in May, inspectors found Cape Cornwall School’s leaders and managers are taking effective action towards the removal of special measures and the school’s improvement plan is fit for purpose. The decision to join Truro and Penwith Academy Trust (TPAT) comes with a significant funding commitment from the Department of Education to secure the school’s future and bring investment in staff training and specialist support. There will also be additional funding in the form of an ‘environmental improvement grant’ to provide refurbishment of the school and investment in facilities for students. Cape Cornwall joins Sennen, Pendeen and St Just primaries, as well as Hayle Academy and St Ives School, which are already members of TPAT. The school is set to convert to an academy on September 1. Executive headteacher Mrs Jan Woodhouse added: “I would like to thank all the team at Truro and Penwith Academy Trust, the Interim Executive Board, and community members who have worked so hard to support Cape Cornwall School. “A very significant investment of time and expertise has happened behind the scenes and this determination to protect and support Cape Cornwall School, for the benefit of the community, has been crucial in gaining the confidence and support of the headteacher, board and Regional School’s Office. The chair of the Interim Executive, Dr Pat McGovern, said: “It has been a privilege to work with the staff and students at the school over the last few months. Cape Cornwall School has a very special role in its local community and I am delighted that we now have a secure and stable future for the school. Joining TPAT will provide a basis to strengthen our existing partnerships with local schools and colleges and will be the cornerstone for continuing the school’s improvement”. Dr Jenny Blunden, the CEO of TPAT, added: “The TPAT Board of Trustees and our member schools are delighted that Cape Cornwall School will be joining us. Our Penwith Hub goes from strength to strength and the addition of Cape Cornwall School will enable us to work across the whole age range of children; from primary, through secondary and into post 16 provision. This means we can share staff expertise as well as opportunities to extend and broaden learning for the benefit of our local children and families. I would like to thank the dedicated Cape Cornwall staff team and the community for all their support and for their commitment to ensuring the future of the school”. A celebration and launch event for parents and students will be held on the evening of Tuesday, June 19 at the school’s annual Creative Arts Showcase.